This quick tutorial shows you how to reset Gnome Shell to its original status in Ubuntu 18.04 LTS. Note following steps will reset most settings to its original status in the default Gnome 3 desktop, but no guarantee of ALL Gnome appearances. 2. 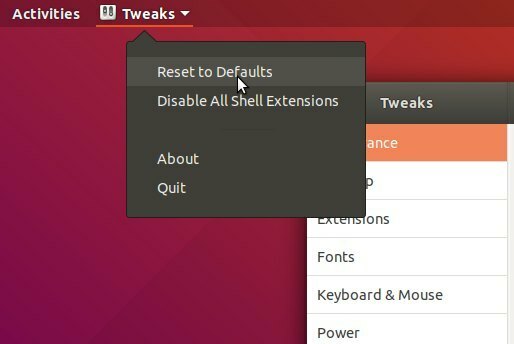 Gnome Tweaks offers an option “Reset to Defaults“. It resets desktop theme, icons, fonts, show desktop icons, and some application window settings. 3. Some changes (e.g., Gnome extensions, favorites applications on left launcher, and some dconf database changes) won’t revert back via the Gnome Tweaks option. I have Ubuntu bionic last I upgrade disto using terminal and restart PC it is automatic gone in terminal mode how can I restore it. Neither of the options actually work properly, this is not resetting GNOME shell, etc. Instead these ways only remove all configuration for those, this is far from what reset to default means..